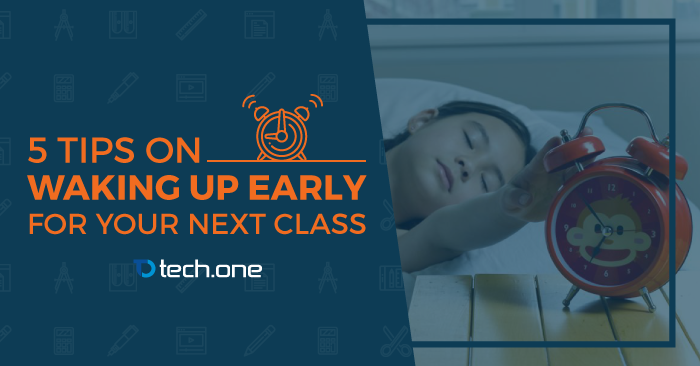 Ever blamed your alarm clock for being late in class? Ever rushed to school without eating taking breakfast? Or thought hard on what excuse to tell your teacher once you reached school? Even though there’s no concrete numbers of tardy students worldwide, everyone had experienced those at some point of their life. Always sleep on the same time every night. Set your bedtime 7-8.5 hours before you have to wake up so you would still have enough sleeping time. If you have to wake up at 6am, go to bed between 9:30 – 11pm. Some people sleep better with the lights turned off, while some can’t sleep without a dim light beside them. The trick here is to know what kind of sleeping environment helps you sleep better. Take into consideration the room’s temperature and noise as well since some people prefer listening to white noise while sleeping. Also, make sure to turn off any electronic devices because this may disrupt your sleep. Know more about “How Artificial Light is Ruining Your Sleep”. The reason for this is simple: you won’t be able to go back to bed with a full bladder in the morning. Plus, drinking a glass of water before going to sleep helps you sleep faster. It will help you relax as water makes your hormones and energy levels balanced. Drink another glass first thing in the morning to keep your body up and running. One of the reasons why you can’t wake up early is that you think you don’t have anything to do in the morning. Make a morning schedule of things you have and want to do before going to school. This will motivate you to wake up early. List down your preparations before going to school and time them accordingly. If your class starts at 8am, wake up two hours before your class and write down all the things that you have to do for that two hours. If it takes you 30 minutes to get ready, 15 minutes to eat and another 15 minutes to get to school, this would allow a remaining one hour for your “me” time. For that one-hour spare, think of an activity – may it be jogging, reading a book, or playing the piano – that will excite you to wake up early the next day. If it takes you longer to get ready for school, adjust your waking time to still have that one hour of me-time. The common mistake for changing the wake-up time is doing it drastically. Change it gradually so you won’t feel drained in the morning (which can cause you to change your thoughts on waking up early). If you normally wake up at 7am, adjust your alarm clock 15 minutes earlier the next day, and another 15 minutes on the following day until you reach your ideal wake-up time. Once you get used to it, stick to it. Never hit the snooze button once your alarm goes off to avoid going back to bed. The goal here is to have enough sleep even you need to wake up early every day. It may be difficult on the first few days but once your body gets the hang of it, you will be surprised how waking up early is becoming a habit after a few weeks. Say goodbye to late slips and detentions due to tardiness! However, if you still see yourself getting late for class, this time due to unfinished assignments, why don’t you try Microsoft O365 that allows you to work on your assignments through your mobile phone? This way you don’t have to open up your laptop and take time sitting on the corner to finish up. These are some tips on waking up early for school. What do you do to wake up early? Share it through the comment box below!